While all bathrooms are inherently practical, there can be so much more to a bathroom than the bare necessities. Modern bathrooms can incorporate luxury and elegance. Accordingly, more homeowners are choosing to create home spas during a bathroom renovating project. Though most people would agree that a home spa sounds like a fantastic option, there are a few simple bathroom remodel ideas to ponder when creating one. The first element of any home spa design is the space. For some people, this may be very flexible, especially if the project is a part of new construction or an addition. However, for others, the question of space is predetermined by the current bathroom and may include bedroom design as well. Because of this, it is important to understand that the feeling of a spa is not created by space alone, but by many other design features, both in terms of bedroom design and bathroom renovating. It is possible to make any space, be it large or small, work for a home spa, as long as it is laid out efficiently. In this way, it may be helpful to consult an architect to maximize whatever space is available. How the space is used is a huge factor in the overall design of a home spa. Though a home spa is about luxury and tranquility, it is also about very practical needs. For this reason, it is essential for any home spa design to be functional, including all the normal facets that individuals need daily in a bathroom. This would include essential elements such as a sink, cabinetry, toilet, shower, and tub. Though decadent features may be more interesting to think about, establishing the basics in a home spa is a good way to ensure that the spa will not only be a nice escape but also a useful room for any daily need. The space and functionality are straightforward features to any room, but these factors alone do not transform a standard bathroom into an opulent home spa. No, this transformation truly begins to take shape in the details. 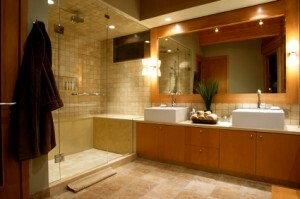 One area where it is easy to define a bathroom as a home spa is in the materials. To fully create a home spa, homeowners should look to upscale materials, such as granite, marble, and slate. Much home spa design incorporates rich earth tones, with vibrant tans and browns to create a peaceful ambiance. These designs are often accented with natural stone on the floors and deep woods for cabinetry for the best result possible. While the right materials go a long way to set the tone for a home spa, there is so much more to a home spa than that. A home spa is truly created by the extra perks incorporated into the space. In this regard, there is no limit. Some of the more common spa features include extra deep soaking tubs, whirlpool baths, separate walk in showers, and double vanities. To embrace the essence of a home spa, homeowners should look to the details such as multiple shower heads, elongated toilets, heated floors, and multiple lighting design options. Along with the extra perks, homeowners should consider designer touches to bring their home spa to life. This can include things such as distinctive table top sink basins, built in candle ledges, or unusual lighting design. The styling of the fixtures should be carefully considered, perhaps with simple, clean lines for a more modern feeling or with intricate details for a more old world look. Some homeowners may choose features such as a claw foot tub or a salvaged piece of furniture to construct the vanity. Even elements such as the paint color and molding choice can have a profound impact on the final result of a home spa. While all of these factors, from space to functionality to designer touches, are important, the most restrictive element of any home spa design is the budget. Unfortunately, as with any design project, everything costs money, so no matter how grand the idea may be, if there are not sufficient funds, then it simply cannot be completed. Therefore, it is pivotal to start any home spa creation with a definitive budget. From there, homeowners should start with what they need and then fill out whatever remains of the budget with the frills and perks that make a home spa so much fun. To make the budget stretch as far as it can, homeowners should always be on the lookout for ways to save money, such as using leftover tile from other jobs or shopping at auctions or other discount stores. All these bathroom remodel ideas have a palpable impact on the end result. Though it may seem overwhelming, balancing these factors can help any homeowner turn a space into a fabulous spa retreat.